In an earlier post (http://www.wayne-wise.com/2011/07/writing-part-5-comics-part-2.html) I talked about my experiences as part of the comics small press, black and white publishing explosion of 1986. Recently, thanks to digging through the warehouse at Phantom of the Attic Comics where I work I've had the pleasure of looking through a lot of issues of Amazing Heroes. This was one of the premiere magazine about comics at the time, one of the place where you could read articles, creator interviews, and see previews of new series in the pre-internet age. It was bi-monthly publication. This has been an amazing bit of nostalgia for me, and seeing several years of comics fandom and my own experiences condensed into about a weeks worth of browsing issue after issue is a little mind-blowing. It's a great sense of perspective and gives a more concrete timeline than my mere memory allowed for. So, while browsing I stumbled across the following in issue #116, May 1, 1987, in the "Coming Comics" section. I had never seen this before. This is fascinating to me. 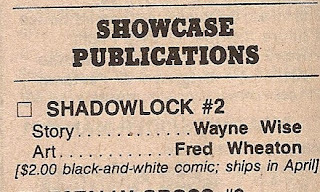 As I said before, we finished the entirety of Shadowlock #1 and mailed it in, but Showcase Publications went under before the book was ever printed. I couldn't find am announcement for it in Amazing Heroes, so either I don't have the issue or Showcase never submitted one. This announcement indicates the good faith from our publisher that there would indeed be a second issue. What I find funny is that we never discussed issue #2 with our editor at all, other than the contract we had for an ongoing series. 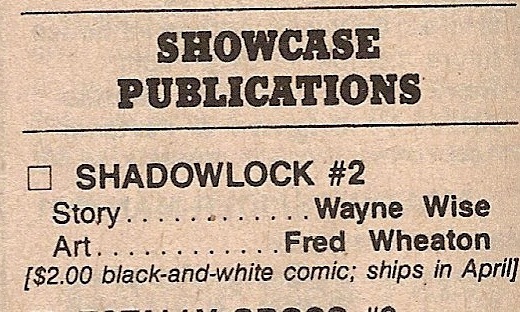 While we certainly had plans, we never wrote or drew a single panel for a Shadowlock #2. A month later, in Amazing Heroes #118, June 1, 1987, there is the following announcement. It pretty much tells the whole tale.